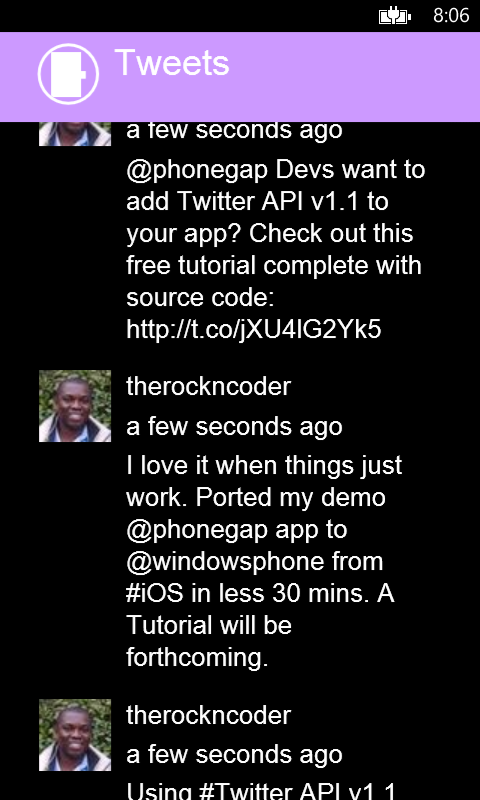 In my next post I will show how to make the Twitter API v1.1 client run on Windows Phone 8. Once again we will use ChocolateChip-UI to get that great WP8 look and feel. Porting this will be so easy it make you wonder why you haven’t ported all of your PhoneGap apps to WP8. For those of you who can’t wait, go ahead and start with the code the code from this post: PhoneGap 3.0+ and Twitter API 1.1 – part 1: User Timelines. All you need to do is add a platform for wp8 and then build it. Seriously that’s all, but in the post I will do it all step by step. Again, great example BUT, how do output the list of tweets without using chui-3.5.0.min.js I use bootstrao so I want to strip out the dependany on chui-3.5.0.min.js but it does not work without it? It would be nice to see page with the tweet list without having to click 'tweets' to make them slide in? Is that possible? Thanks! Not sure when I will have time to look into doing a post without Chocolate Chip UI, probably not for a few months. But all you really need to do is change the router and the views. The tweets are contained in tweets.js in the collections folder. Once the fetch method is called on it, it will go off and grab the 20 latest tweets. Do a toJSON on the collection and you have all you need to write your own view. Thanks Troy, the jSON stuff is well above me 😉 I have it working but Ive kept the CC UI in for now. It would be cool to see how to do a list of tweets onto a plain html page with no UI layer. At the moment you have to click the tab to fire off the loading of tweets from what I can see – I dont see a way of displaying them without clicking it! !